A few selected pictures have been posted in the order of the show. If you are interested in more photos of any event / rider combination, just let me know the photo file number and I can post any additional photos I have. To limit the size of the posted images all files have been reduced in size and quality. Any prints ordered will be cropped and edited as needed to provide the best quality print. The ones with red or white writing were individually edited some and the ones with green writing were batch processed. black and white or sepia tone. Color matte finish is standard. Great gallery, very good action shots. The fall sequence is very good, glad to see the rider wasn't hurt. 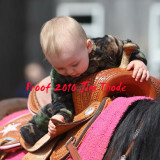 The shots of the little guy in the saddle are priceless.